The plaque honoring Jim Howard at Third and E streets. James "Jim" Howard passed away on Nov. 2 at the age of 100. "Jim was a quiet leader of this community, leading by example and few words," Eureka Mayor Frank Jager said in a press release. "When Jim spoke, others listened”. Howard, who operated a shoeshine stand in Eureka's Old Town for 36 years, was an active member of many local organizations and served as a city council member for four-and-a-half terms. Among his many other contributions, Howard was instrumental in having Old Town declared a National Historic District in 1973, revitalizing the area to make it a center for tourism and commerce. 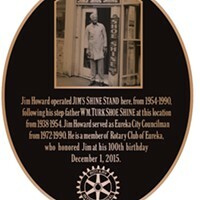 On June 22, the Eureka Rotary Club honored Howard with a plaque at the site of his former stand. The city of Eureka will fly its flags at half-mast in honor of his passing. A memorial service has tentatively been scheduled for Dec. 5 at the Eureka Elk's Lodge. Resource Center, and Humboldt Grand Jury. 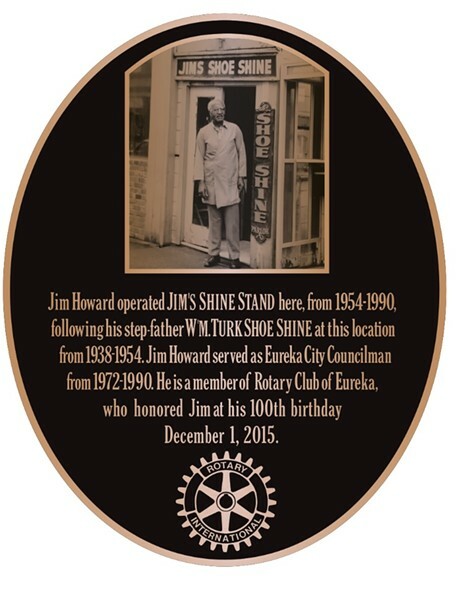 James Howard was a small business owner in the City of Eureka, operating “Jim’s Shoe Shine” at 310 E Street from 1954 until his retirement in 1990. Former Councilmember James Howard turned 100 years old on December 1, 2015. Mayor Jager commented that “Jim was a quiet leader of this community, leading by example and few words. When Jim spoke, others listened”. Flags will remain at half-staff through Wednesday, November 9, 2016. Services are tentatively planned for December 5th at the Eureka Elk’s Lodge.